The National Park Service announced last Friday that the cherry blossoms around the Tidal Basin in Washington DC were officially at peak bloom on March 25, 2016 with 75% of the trees in full bloom. It was peaked more than two weeks earlier this year than last year. Postcard US-3373353 to Czech Republic shows the cherry blossoms around the Lincoln Memorial with a matching USPS Gifts of Friendship stamp. 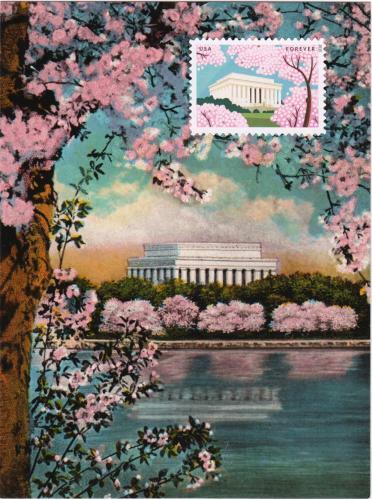 Labels: blossom, cherry, Czech, friendship, gift, National Park Service, peak, postcard, PostCrossing, spring, stamp, Tidal Basin, US-3373353, USPS, vintage, Washington D.C.